You’ve spent more than a few years learning to understand and adapt to your pet’s unique quirks, and they to yours. You know one another inside and out — your habits, your preferences, your pet peeves. But what happens when your close-knit family gets… rearranged slightly? When a living situation changes, pets are often the first victims. But rather than take your precious companion to a shelter simply because they have to adjust to new family additions, instead, consider helping your pet overcome the changes in stride. To help you and your pet navigate the many events (unexpected or planned) that can switch up the family dynamic, here are some of the best ways to manage changes in family circumstances with as little stress as possible. Welcoming a new little member into the household is cause for celebration — congratulations! But depending on your individual pet’s temperament, a bundle of joy can also be a source of stress for animals. The combination of new smells, sounds, and a possible decrease in attention can result in behavior changes in your pet, or even depression. 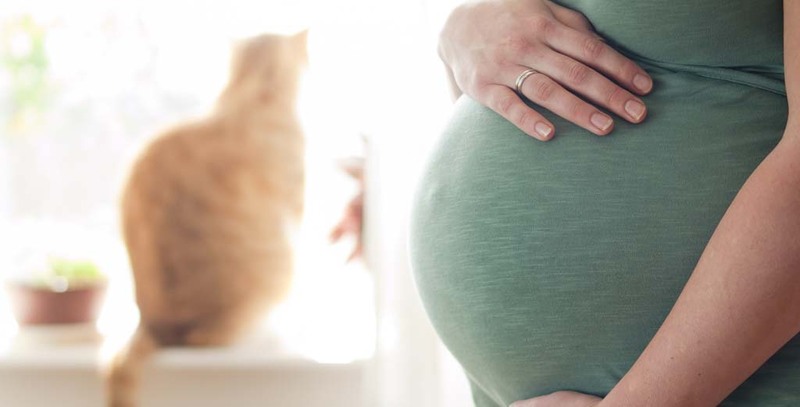 In addition, curious kitties and pooches may get in the way of the new little one, putting paws on the crib, shedding in the baby’s room, or worse. To help your pet prepare for the new arrival, and avoid any disasters, it’s important to familiarize them with the wide variety of stimuli associated with infants, just as one would during puppy socialization. The National Humane Society lists a number of ways to prepare your pet for a new addition to the family, but here a few key takeaways to consider. Address any existing behavior issues during pregnancy if possible, before the new baby arrives. Whether excessive barking in your pooch or swatting in your feline, it’s best to consult a professional or take extra steps to eliminate negative behaviors while you have the time and energy to spare, rather than after the baby has arrived — especially if those behaviors could be harmful to a little one. Teach your pet to refrain from jumping into your lap until invited. When cradling a new baby, a jumpy or possessive pet trying to share the spotlight can be an unnecessary challenge. Familiarize your pet with infant-related stimuli. Sprinkle baby powder or baby oil on your skin to accustom your pet to the new smell. Similarly, as new furniture is brought in, introduce them to the new items — it’s their home too, after all! DO wear gloves while gardening. DO wash all fruits and vegetables. DO wash hands carefully after handling raw meat fruit, vegetables, and soil. DON’T feed pet cats raw meat. Whether it’s a new significant other or spouse after a divorce, or a relative coming for a long-term or extended stay, introducing a pet to a more mature family member is in many ways easier than infant introductions. Often, the new addition to the household has the benefit of being able to interact directly with your pet to calm its nerves. However, these introductions still pose their challenges. Occasionally, this new addition may come bearing unexpected allergies, or perhaps even a dislike for certain animals altogether, which can lead some pet-parents to feel obligated to relinquish their pet to a shelter. Everyone knows that meeting the family of a significant other is a major step in a relationship, but introducing a date or new spouse to your much-adored dog (or cat) can be just as nerve wracking. Studies show that an animal’s opinion of a new significant other can often make or break a relationship, especially considering both dogs and cats are highly sensitive to change. Dogs are more likely to be possessive or territorial when it comes to their space, which includes their owners, while kitties are more often skittish and/or passive-aggressive. Before a significant other moves in, it is vital to get your pet accustomed to their scent beforehand to ease the transition. In the weeks before a move-in, arrange for a few items of clothing or personal items and place them around the house. Allow your pet to smell the items at their own pace, and immediately reward them with a treat or positive reinforcement. Introduce the two in-person in a neutral zone. Much like with pet introductions, surprising a pet with a new resident on their own turf can trigger territorial aggression. Instead, a visit to a park or other “happy” place for your pet will allow them to scope out and familiarize themselves with the new human in a non-confrontational setting. At KirinGie.Me, we know your pet is part of your family, but when family circumstances change, it can be a challenge. That’s why we always strive to provide the best, most up-to-date information and solutions for pet parents at every stage so that you never have to make the difficult choice to give up your companion!